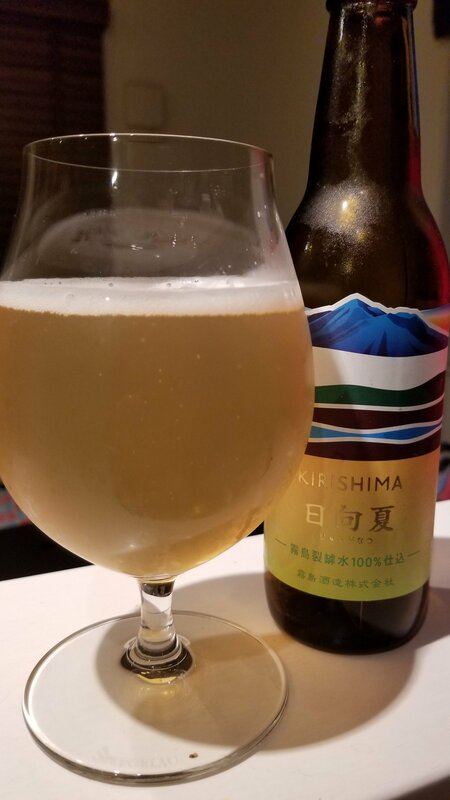 Kirishima Hyuganatsu is a 5% fruit beer from Kirishima Beer, based in Miyakonojo city, in Kyushu, Japan. It’s part of their all-year round range of beers can be found in both bottles and on tap. Kirishima Hyuganatsu is brewed using locally grown hyuganatsu, a kind of citrus fruit grown in Japan. It also uses ginger and lemons but at the time of writing, it’s unsure where those came from. Kirishima Hyuganatsu poured out a hazy light straw colour with a thin amount of white head on top that faded to a few bubbles around the edge of the glass. The aroma was a distinct lemony citrus aroma with not much else coming off of it. There wasn’t much else at all coming from Kirishima Hyuganatsu – if there were any hops in it, then they were probably added in miniscule amounts as there was nothing that could have been attributed to them. Drinking fruit beers are a funny thing – if they are beer with a dash of fruit added, then the flavours can be balanced. Kirishima Hyuganatsu was not like that. It’s fruit the whole way with nothing else going on. The lemony citrus body just kept coming. And coming. And coming. There was a flash of sweet tartness to it, but that was the only flavour in the bland desert of fruit. If you like hyuganatsu then you’ll love Kirishima Hyuganatsu. But it isn’t a beer by a long way.